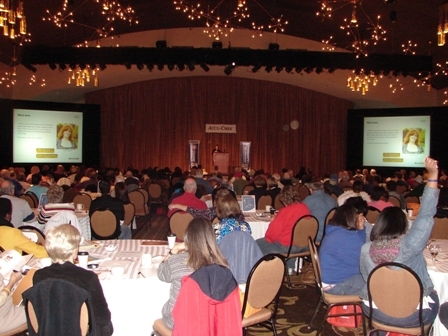 On Sat November 13… about 300 people gathered at the fabulous Chase Park Plaza Ballroom in St. Louis to be part of So What Can I Eat?, a community diabetes education program presented by the St. Louis Diabetes Coalition. Joan McGinnis, MSN, CDE introduced featured speaker Jill Richards-Divita, RD, CDE of Cleveland, Ohio who delivered an informational, witty, and practical presentation that focused on carb counting. She fielded excellent questions from attentive and engaged participants who had come from all over the region. This outstanding event was made possible by the generous support of Roche Accu-CHEK and promotional assistance of many partners, including SSM HealthCare, Washington University Diabetes Center, Saint Louis University, and Allsup. Questions and comments by the participants re-affirmed a belief that the #1 question of people with diabetes still is: So What Can I Eat?. The gathering was very inspiring… providing motivation to participants as well as the Coalition to keep pushing forward its mission to improve diabetes education, care and quality of care across the region.